All Chromebooks are powered by the Google Chrome operating system; an enhanced version of the largely popular internet browser. All of your apps are accessed through the web (or downloaded for use in offline mode) and all of your data is saved to the cloud, so there is no need for large amounts of hard drive space or RAM. One of the advantages of Chromebooks is ease of administration. The web-based Chromebook Management Console makes it easy for schools to deploy Chromebooks while maintaining fine-tuned control of these devices. Management Console licences can only be obtained from an authorised Google partner. Getech are one of only a few select Google Authorised Education Resellers within the UK who can supply you with these licences, at special educational prices. Google Apps for Education is a set of online software applications which can also be enabled for offline use, offering much more than just a replacement for the Microsoft® Office suite familiar to Windows® users. Designed especially for education, this software suite is revolutionising the learning experience in schools throughout the world, earning rave reviews from teachers and students alike (please click here for further information). 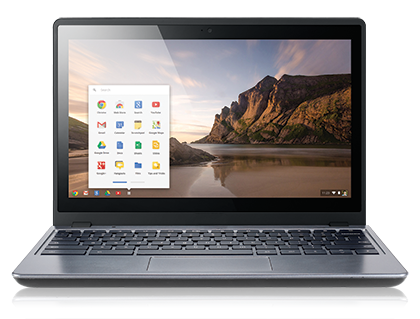 Chromebooks start instantly when they are turned on and are ready to use within 8 seconds, as opposed to a legacy environment that keeps users and the entire class waiting for a number of applications to start up in the background. Great for when the devices need to be constantly closed and opened, allowing for class interaction to occur without delays.